1st & 3rd Saturdays:​ This Men's Bible Study group meets 9 a.m. to 10 a.m. on the 1st and 3rd Saturdays in the Discipleship Center. Men from the church and community gather each third Saturday of the month at 8 a.m. for breakfast, fellowship, and sharing Christ-centered life experiences. Mondays: 10:00 a.m. amd Wednesdays 6:15 p.m. in the the Discipleship Center. The group is led by ​Deloris B. 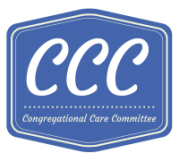 If you know a church member who might need help with prepared meals during a life-changing time, contact Congregational Care Committee Meal Manager Keli Soliz. She will coordinate providing the meals. If you're yarn-inclined, please join our Prayer Shawl ministry group as they meet for fellowship and making baby blankets, hats, and prayer shawls for anyone who could use a warm and cuddly reminder of God's love. The group meets on the 1st and 3rd Tuesdays at 1:00 p.m.